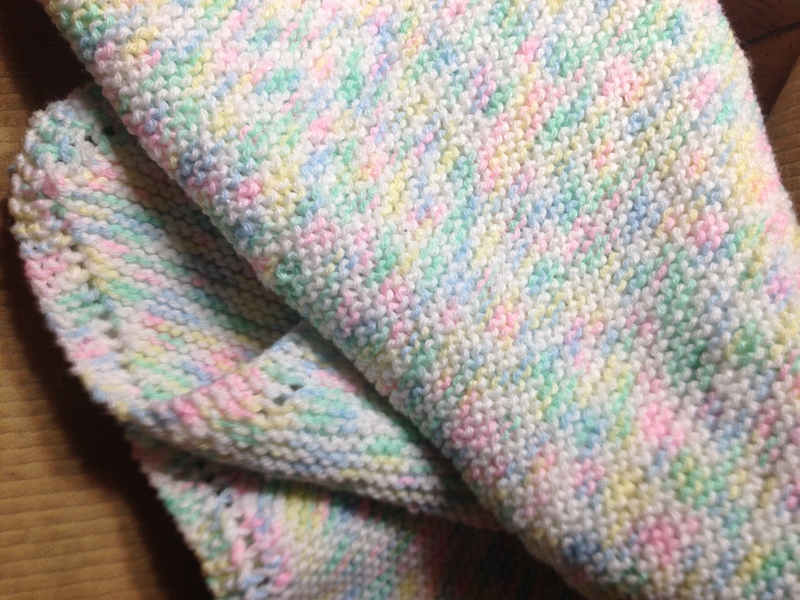 This weeks clue was some what delayed, so I took the time I was going to spend on that on finishing a baby blanket. Its done and now I have a new item for my Etsy shop. 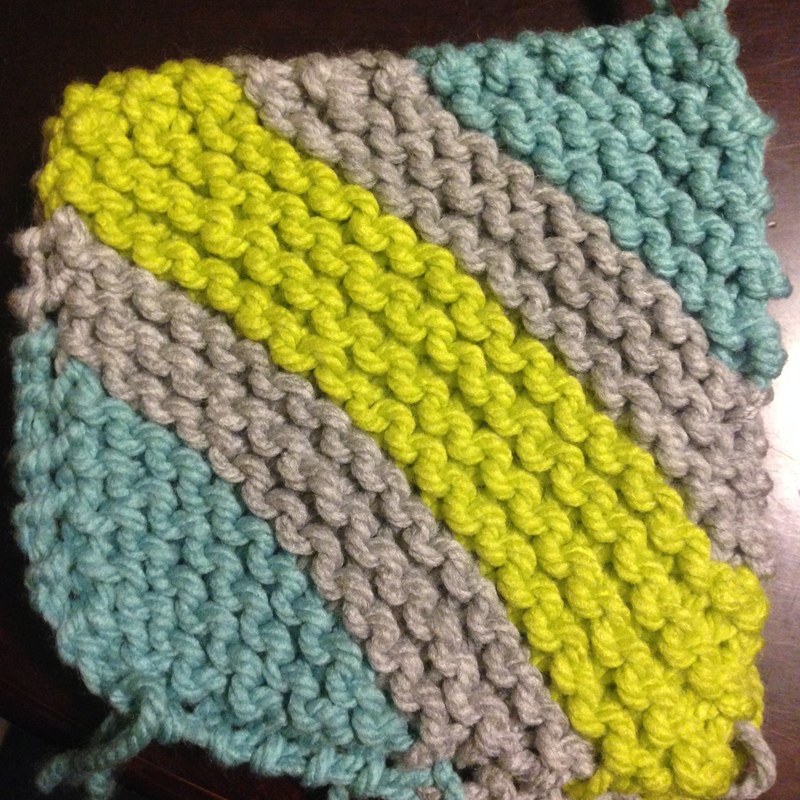 The clue was to make a striped corner to corner square. The last two weeks we were to make 4 squares each but this week its 8. I only have 3 done because the clue was late and I was busy finishing projects and starting others. I’m really liking the colors that I chose and the way that the stripes have ended up. It is very cold here so knitting is how I’ve been spending most of my time while watching my favorite TV shows. A little bit of a tangent Parks and Recreation ended last night and I loved every second. You should all watch it. I love knitting in public and on Monday night my brother was in an orchestra concert so the nice orchestral music was good to knit along to. I had to start something and take it with me as the baby blanket was to big at this point to fit into my bag so i started a 4 by 4 rib scarf, and in the hour and a half we were there I knit 9 inches. That’s not to bad for me. This will be my new take-along project when I’m in waiting rooms. Let me know what you’re working on in the comments, thanks for reading. Love the colors that you have chosen. This is my first kal and the first time working on an Afghan. Could you please tell me what to do with all those loose ends especially for this week as we need to keep changing colors. Thanks in advance. Thank you for your prompt reply. At least I know now that I am not alone in leaving the ends to weave later. I am doing both the knit and crochet along – kind of ambitious you may say. For crochet, Mike shows the details of the week’s clue from start to the end in his video. I was kind of lost on the knitting as there isn’t any samples for us to refer to until I found your blog. Now I am assured that I got the first 3 weeks right. A great motivation for me to continue my quest for 2015 which is to master the art of knitting. Thank you.